We are delighted to finally commence the main building phase of Scape Living’s student accommodation scheme at Aungier Street. This new and exciting 298-bed student accommodation facility is located in the heart of the city, situated within a short distance of Trinity College, Dublin Institute of Technology and Dublin Business School. 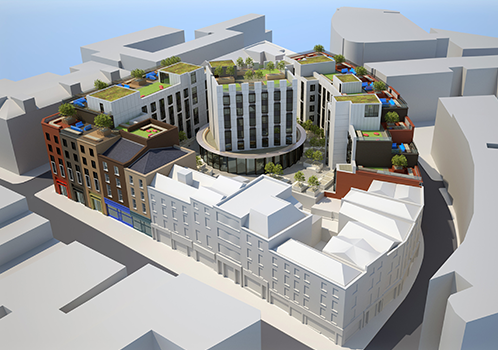 In addition to the new bedrooms, the development will also feature ground-floor retail units, a gym and a basement, all being constructed on this city centre site. John Paul Construction have been engaged over the past year through a pre-construction services agreement to manage considerable early enabling works on the challenging site. These works have included site clearance, demolition and conservation works, alongside extensive archaeological works across the historically important site. With the enabling works now completed, the main substructure works are progressing. The scheme is due to be completed in 2020.